The Lockner Estate found itself in the press last week when a vast array of papers claimed that disused garages could be turned into pop-up homes and rented for £11 a week. 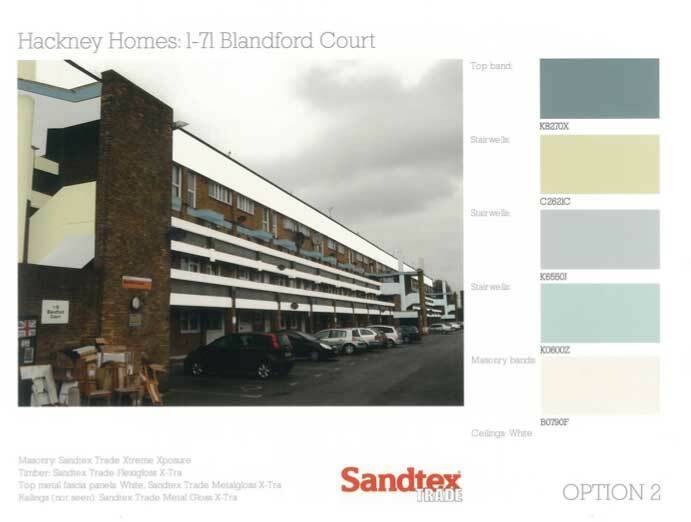 This story is not true and it stems from an illustration in which the architects Levitt Bernstein used images of the garages shot from Blandford Court to illustrate their design concept Pop-Up HAWSE. The company was approached by TRA members in November 2012, seeking clarification and an apology. Published below. The story was later picked up and published in the Mail on Line, The Metro and The Evening Standard. We understand your concerns that the illustration shows an area of the Lockner Estate and we apologise for any upset or frustrations we may have caused. The reason we did not contact anybody at the estate prior to using the image is that the concept is currently not specific to any area or site and the computer generated image of the transformed garages used against the recent press articles was created to illustrate the idea, with the proposal to adopt in suitable sites in London should the project move forward. We feel the Pop-up HAWSE is a positive and creative concept which enables people to learn new skills and transforms under-utilised spaces to create a temporary place to live, learn and work as a kick start project for the regeneration of the surrounding estate or wider area. We have received some very positive feedback for the idea for housing and other uses in redundant garages and we would be very pleased discuss it further if you would like. Again, we apologise for any upset we may have caused. At this very early stage the project is currently only a concept and the image was strictly for illustrative purposes only and was not intended to be specific to any area. A Section 20 has been sent out relating to the forthcoming repair of footpaths and carriageways on the Lockner Estate. 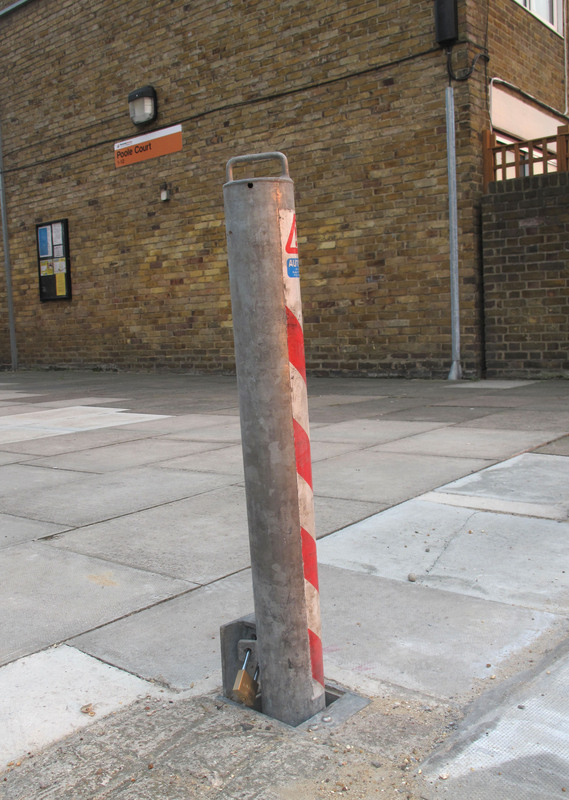 Are Hackney Homes going to contribute to paying this fee, as it is on many occasions their workmen who drive onto the estate and break the paving-slabs. Although it would be good to have the surface redone is it wise to do it before the paintwork? Last time the estate was re-painted the pressure from the scaffolding broke many paving slabs, which were then replaced at an expense. Please get your written observations in before 21st September. 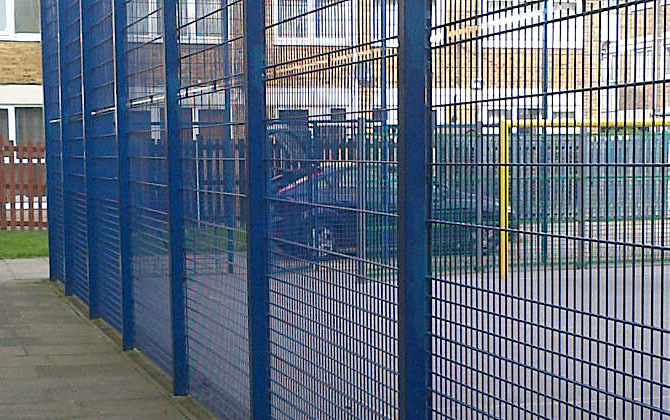 The planned external decorations work on the estate has been postponed pending review of the contract under which it was to be carried out under. A Notice of Proposal for the new painting contract will be issued once discussions between Procurement and Legal Services have consulted. Well that really is news to us! 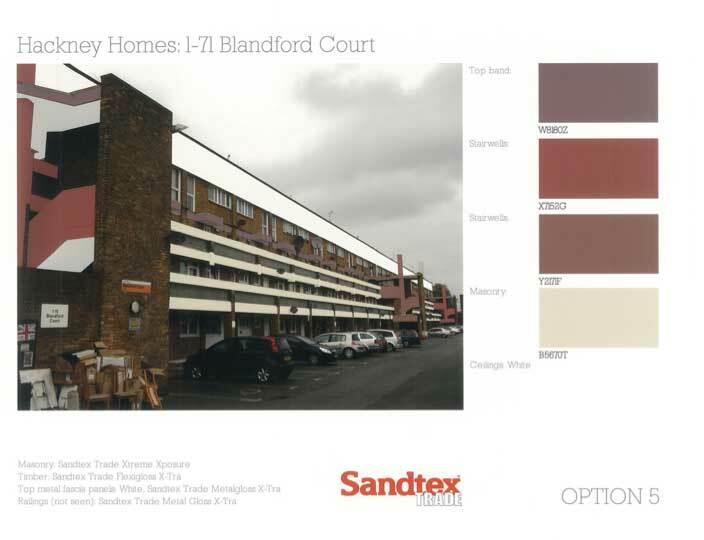 Here are some colour suggestions that Hackney Homes have come up with. In response to a Section 20 letter I received regarding the planned paintwork on of the Lockner Estate I’m contacting you in regards to the current contractors. I have two points I would like to make regarding this matter. I note that the long-term agreement entered in 2005 with Hackney Trading Services has been extended. As a leaseholder I have not been informed of this extension. If approached I would have submitted a comment complaining about their original work in 2005. At that time the contractors painted around my garden furniture rather than move it. When I approach they came back to paint the border but didn’t do any of the preparation work to the concrete so the paint in that section was always in a poor state and many parts flaked off. Evidence is now under my decking but could be disturbed if necessary. I would like to see transparency in the process of extending the long-term contract. I’m concerned that we are not getting value for money as the original tendering process begun as far back as 2004 and the same company still holds the contract. I demand clarity to why this job has not been put out to competitive tendering and leaseholders have not been allowed to comment on the extension. How can we be getting the best value for money when the original tendering process begun in 2004 and the contract is still running without anyone been given the opportunity to come up with a better quote? Looking forward to receiving your answers to the questions above. I am writing from the Residents Association on Lockner estate. 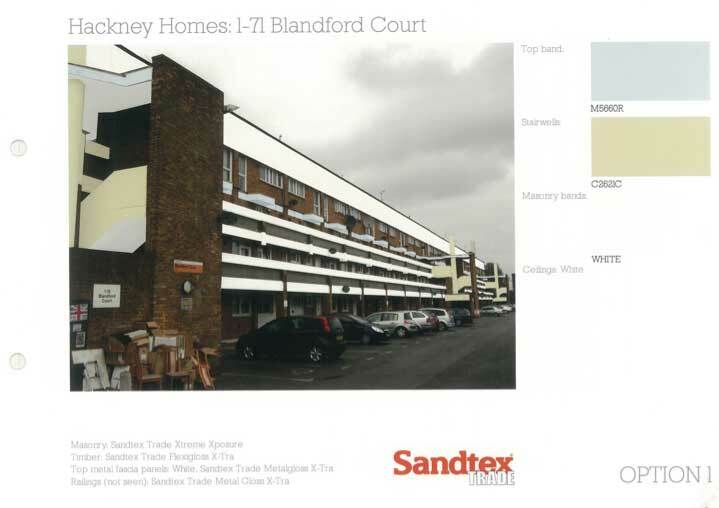 Some residents have recently received letters from the major works section detailing plans to repair and repaint previously painted surfaces. 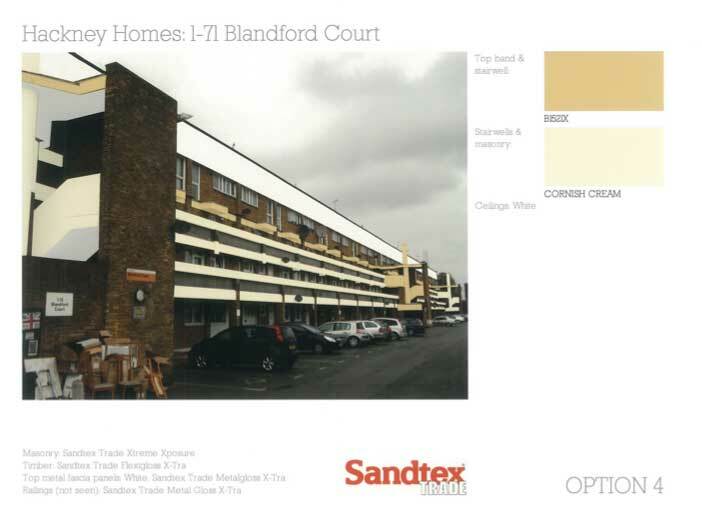 The costs have been estimated at approximately £2800 per property (estimated for property’s with living space factor of 48.5), although it is noted that only some blocks on the estate are being worked on. It is our understanding that Hackney Trading Services are the contractors appointed to carry out the work and that they have a long term agreement with Hackney Homes – please refer to the section 20 letter sent to leaseholders by James Roche dated 1st April 2005. This agreement was for five years from April 2005. There is some ambiguity about the extension of this contract; leaseholders have not had any information regarding this matter. Residents have concerns about the high cost of these works, particularly as the invoice is not a result of a competitive tendering process that has been transparent to residents who will be facing such a large invoice. We are writing to ask why there has not been a transparent competitive tendering process, particularly in view of the fact that the long-term agreement with Hackney Trading Services has since expired. How can we be certain that this cost is competitive and value for money? 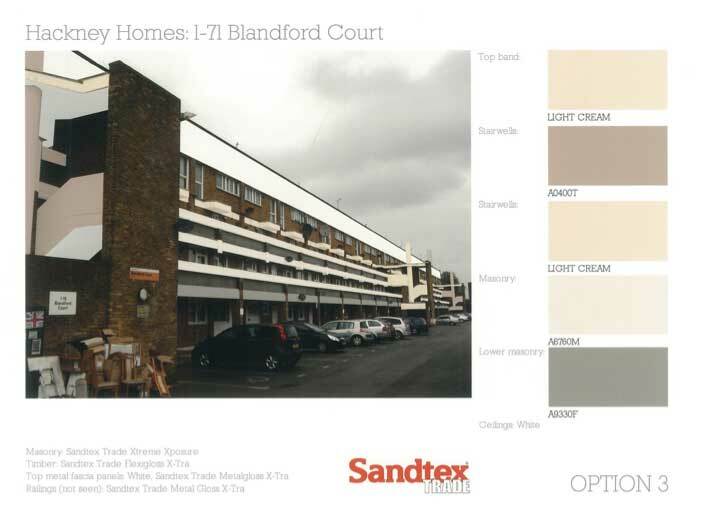 Finally, it is noted that leases sold prior to 1989 do not enable Hackney Homes to recharge for works of improvement. Can we ask who pays for works of improvement for properties with leases this is applicable to? Finally the padlock for the collapsable bollard by Poole Court has arrived. The emergency services have a copy of the key. This enables them to access the estate if called out. Thank you very much David Townsend, Helga De Jesus and Amy Willoughby for your help. The Lockner Estate TRA would like to thank everyone involved at Hackney Homes for their swift action to resolve the problem caused by a collapsed drain. On Friday the 16th March the problem was discovered and reported and within two hours Hackney Homes’ drains men arrived. They worked until late and were back again at 8.15am on Monday morning. Drain Aid took over from there and fixed the actual problem. Since the flat had been emerged in slime, silt and kitchen drain waste – it was given a thorough deep clean on by a professional cleaner. We appreciate your help and your swift action, which saw this problem resolved within less than a week. It is much appreciated. Have you noticed contractors vans parked on Lockner? 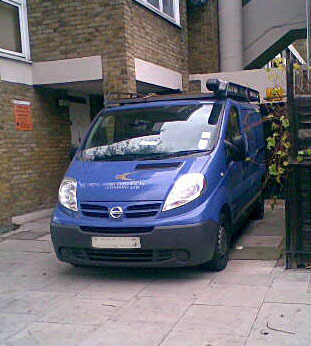 They commonly break the paving slabs when they drive their heavy vans into our estate – and YOU as a tenant or resident get charged by Hackney Homes to have them replaced. Save yourself some money by reporting any parked vans on the estate to the TRA and we will chase it up for you. Email with a photograph, the registration number, date, location and time to: locknertra@gmail.com and we will make sure that the contractors, and not the residents, are charged for repairs. Lovely new plants have arrived! Please water me if I look thirsty. 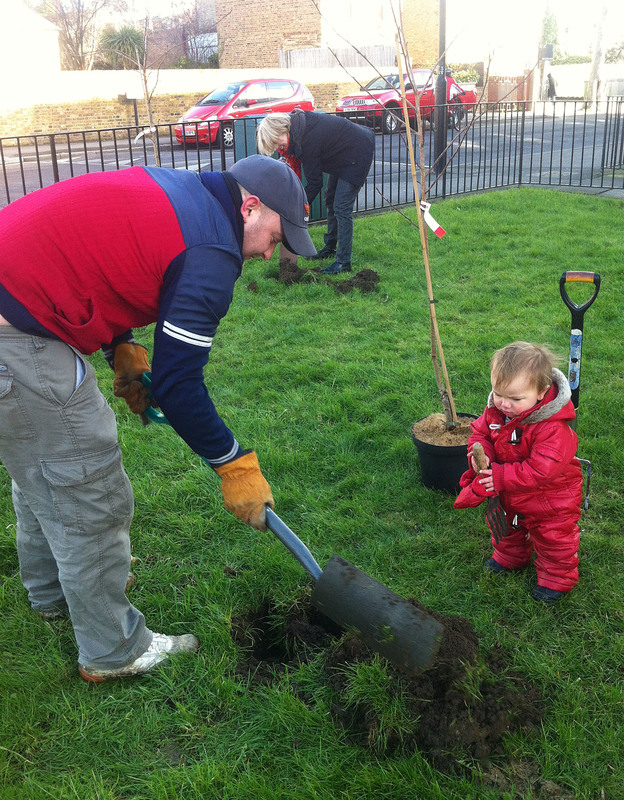 On the 1st February 2012 the TRA wrote to our estate manager , Abi Marqis, and the ground maintenance area manager, Wayne Hibberd, to requested that the borders on the Lockner Estate are improved on. We are now delighted that both the areas highlighted in the letter have benefited from some TLC. Thank you very much! On 24th January Jonathan Hoskins from Lockner TRA and Sam Causton from Shoreditch Citizens went door-knocking on Lockner, to begin to find out how many homes on the estate are affected by damp. 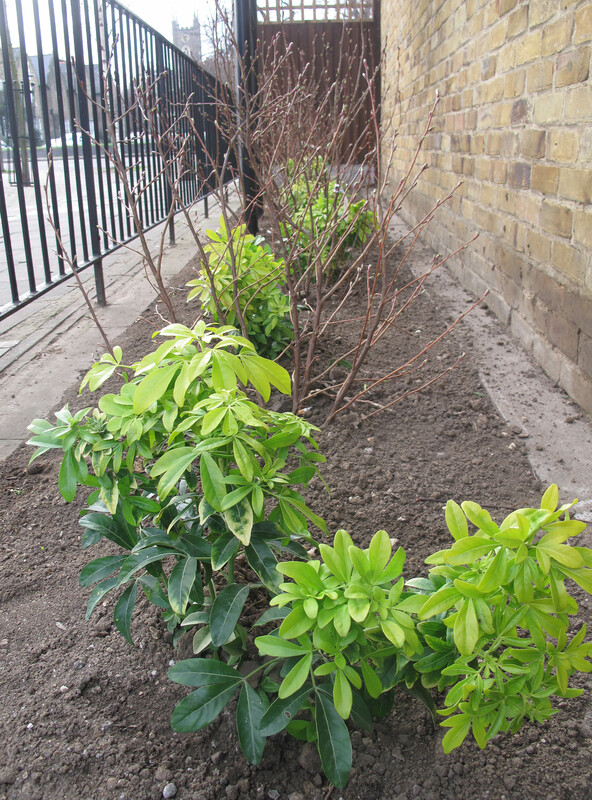 This was part of Shoreditch Citizens’ campaign to work with Hackney Homes to tackle damp in Hackney Homes properties. The response was varied, though some homes seem badly affected. Some tenants volunteered to keep a ‘log book’ to record what happens when they contact Hackney Homes in their efforts to get their damp fixed. These log-books will later be returned to Shoreditch Citizens to become an important part of the campaign and hopefully see an end to damp in Hackney Homes’ properties! If anyone else on the estate is affected by damp in their home or is interested in joining the campaign, the TRA would like to hear from you. Your TRA reported broken security lights in two archways on Dorset Court and Blandford Court on the 28th November 2011 to our Estate Manager Abi Marquis. An order was raised (00715316) and we were told that the next available appointment for engineers was on Monday 5 December 2011. The TRA has now issued a formal complaint regarding this matter. More information on the Formal Complaints page. The Stage II complaint was upheld on the 29th February 2012 on the basis of the time that it has taken to repair the three lights reported faulty in November 2011. The security lights are now working. 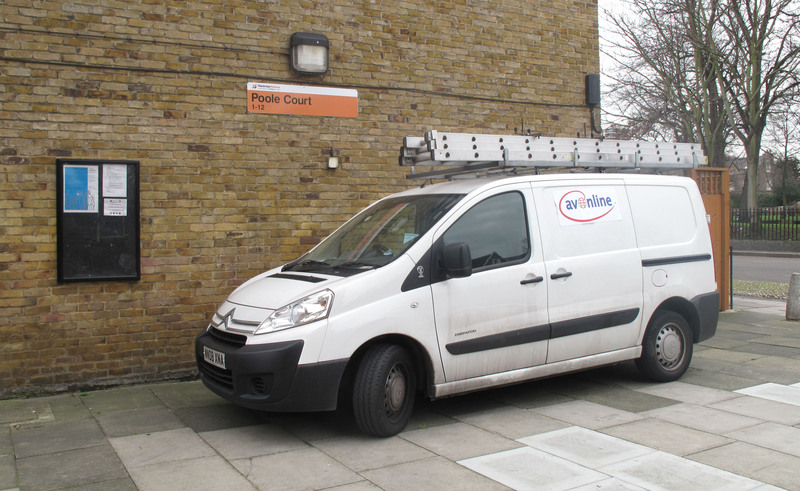 A number of problems of differing nature are being experienced across the estate with the Avonline Installations. My recent experience has been professionally & satisfactorily resolved. Please pass info onto friends & neighbours who may not have access to internet.